Milky Way Photos- thanks Al!! 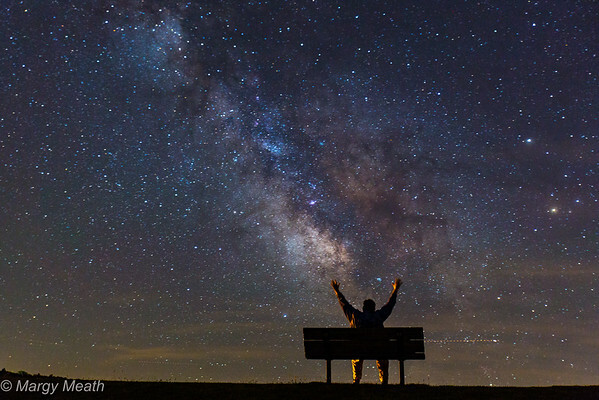 Last year, Al very generously offered a Milky Way photo tutorial! He spent a few hours showing us how to capture this most magical sky. Since then, I have tried to make some of these photos both close to home and when visiting Cape Cod. I am still working on it but am pleased with what I've captured thus far. EVERY time I do this I think of Al and send a "thank you" to him - hopefully, he sees this to know how much he is appreciated! THANK YOU AL! 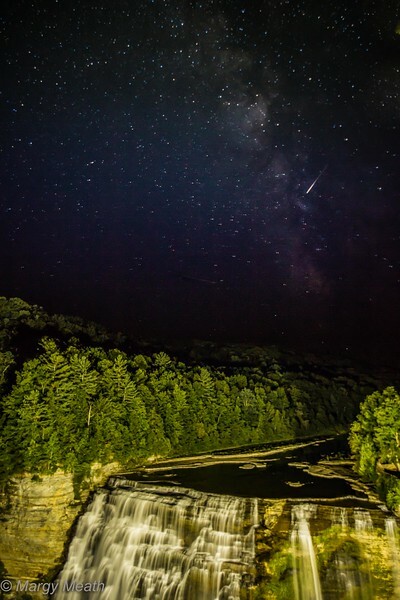 I hope Carol will also share some of her VT Milky Way photos that she has captured in the past year!! And, I hope that my first several days in VT will contain some clear skies as it is likely the last time to capture the magic until 2017! Re: Milky Way Photos- thanks Al!! Any chance Al could give us a brief version of the techniques you learned? first, you need a tripod A wide angle, fast lens (2.8 or better) is important. I use my Canon 16-35 and also recently picked up a Rokinin 14 mm that gets rave reviews for astrophotography. Set your white balance to K (Kelvin) 3200-3400. Start with ISO of 1600 - 3200. Set camera to manual - f 2.8, infinity focus (this varies with some lenses), expose 25 seconds and adjust as necessary (i've never gone beyond 30 seconds). It's important to find DARK skies where you are shooting as well as to the south as you want to eliminate light pollution - www.darksitefinder.com is a good website for checking out possible locations. 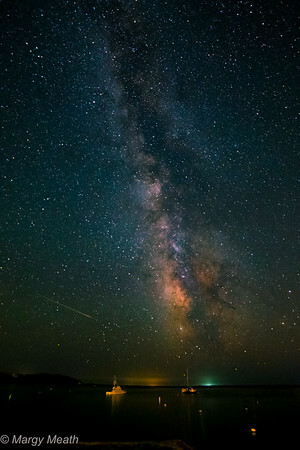 For example, where I live, there are super dark skies to the north because of Lake Ontario BUT south of that area are many cities and towns so it's not a good place to shoot the Milky Way - but, if I drive 20 -25 miles south of where I live, the skies are dark AND the areas south are also relatively dark. In the US, the "galactic center" of the Milky Way is only visible certain times of the night (for a few hours) and the year. New moon is best as too much moonlight washes it out. It's always in the southern sky although this month and next is more southwest. PhotoPills is a GREAT app if you have an iPhone. THIS weekend is a really good time to shoot the Milky Way - the moon is NEW and the Milky Way is visible during reasonable hours (about 9:30 pm - midnight EST). Hope this helps and maybe Al will see this and join in and/or Carol will add her thoughts as well!! Outdoor Photography had an article on shooting the Milky Way so, between your notes and that article, I am ready to give it a shot (or 2 or 12). Quick follow-up, does anyone know what color (on darksitefinder.com) would be considered the minimum color for good shots? I am stunned that little of Vermont gets below light green which is the middle of the spectrum on that site. Looks like Kettle Pond is in a darker area as is the Great Cliffs. One of those might have to be the choice for this year. Noty sure about option to the southern sky for both. May have to tinker around. Does anyone know if the moon having set has the same effect as it being new or does the light still obscure the night, even when the moon is no longer visible? For Android users, the best option seems to be an app called Stellarium. I just bought it ($2.49) and don't yet understand it completely. There is also an free app for your computer from the site, as well. I was out shooting 2 days this past weekend and am hoping for clear skies during late September/early October when I am in VT. In terms of the moon, a setting (or rising) moon still gives off some light but I've capture Milky Way photos in both circumstances with crescent moons. Here are 2 shots from this past weekend - the 2nd one is a blending of the same scene taken with 2 different exposures - 1 for sky, 1 for brightly lit falls. it's a work in progress but i really wanted to create it to capture the shooting star!! $179 for anytime access and downloads but, free to attend on broadcast nights. I've just llogged into the SOV site for the first time in a while because I have been traveling, and still am. I'm writing this from Canmore, AB Canada. We left Glacier National Park today and will be doing the the Banff, Lake Louise, Icefields Highway tour over the next few days. Unfortunately, it rained every night in Glacier so I didn't get any night shots. 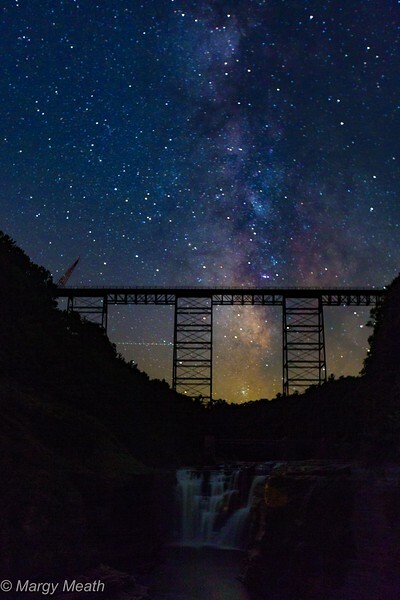 Margy, I am happy to share my knowledge of night sky photography with anyone who is willing to listen and I enjoyed our night sky photo op last year at Killington. The reflections of the stars in the pond were really nice. Anyone who is interested can find my article on night sky photography on my website at http://www.goldimagesphoto.com/Nightscapes and here's the photo I made with Margy at Colton pond: http://www.goldimagesphoto.com/Portfolio/After-Dark/i-hsSTJpJ. 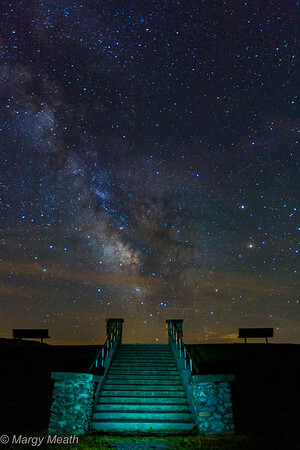 Here's a night sky shot I made with Carol at May Pond: http://www.goldimagesphoto.com/Portfolio/After-Dark/i-Fq9cHRg. Here's one I made at Lake Willoughby last year shooting with Carol and Andy: http://www.goldimagesphoto.com/Portfolio/After-Dark/i-q9PFNVH. deaner1971 wrote: Does anyone know if the moon having set has the same effect as it being new or does the light still obscure the night, even when the moon is no longer visible? Dean, new moon or set moon, it doesn't matter. You just don't want the moon lighting up the sky. That said, a crescent moon, can add just enough light to get a good foreground without having to composite sky/foreground shots. I've found that it is still possible to get a good Milky Way shot that includes the galactic center even in November. Here are a couple of examples from two different years in November in Arches National Park: http://www.goldimagesphoto.com/Portfolio/After-Dark/i-HmGH9PJ andhttp://www.goldimagesphoto.com/Portfolio/After-Dark/i-Nsrsr7R. I think Photo Pills is the absolute best app for night sky photography. Not only will it show you when the galactic center will be visible and where it will be, it includes and augmented reality feature that uses the phone's camera to show you where the Milky Way will be at a particular time. That way, you can find the foreground you want in your shot and find the exact time the Milky Way will be where you want it. Here's an example: http://www.goldimagesphoto.com/Portfolio/After-Dark/i-PjxxKDW. I wanted the galactic center of the Milky Way to appear between the Turret Arch and the mountain next to it. With Photo Pills, I held the phone up at the spot and turned the time in Photo Pills until the galactic center was where I wanted it. Then I returned at that time to get the shot. I didn't have to leave anything to chance. I know that some of the regulars to this forum are starved for color and can't wait for October. I've seen and photographed a bit of color here in the west and I'll try to post some photos to the foliage forum when I get a few minutes during my travels. autzig wrote: I'm writing this from Canmore, AB Canada. We left Glacier National Park today and will be doing the the Banff, Lake Louise, Icefields Highway tour over the next few days. I spent a total of four weeks photographing in the Canadian Rockies in the autumns of 2014 and 2015 so I am, by definition, jealous. I could easily spend the rest of my life wandering around Banff, Jasper, Yoho and Kootenay National Parks, not to mention the Bighorn Wilderness in Alberta. I look forward to seeing what you capture while in the region. I spent 5 days in Jasper in August! NOt nearly enough time but the Canadian Rockies are simply amazing!! I tried to see Lake Loise but it was packed with people and cars so went to Lake Moraine instead and it was stunning. Jasper is beautiful and Spirit Island was worth the trip. Hope your weather gets better Al and looking forward to seeing your photos! mmvt wrote: I spent 5 days in Jasper in August! NOt nearly enough time but the Canadian Rockies are simply amazing!! I tried to see Lake Loise but it was packed with people and cars so went to Lake Moraine instead and it was stunning. Jasper is beautiful and Spirit Island was worth the trip. I spent a total of about eight days in Jasper over the last two years--it's a truly beautiful park, and many of the best spots aren't all that close to the town of Japser. BTW, you definitely got the better end of the deal if you missed Lake Louise but hit Moraine Lake. Lake Louise is a very pretty sight, but Moraine Lake is at another level. Some of you have asked to see my photos when I got back. I now have them posted on my website. I will start another thread about that so this one doesn't get even more cluttered. 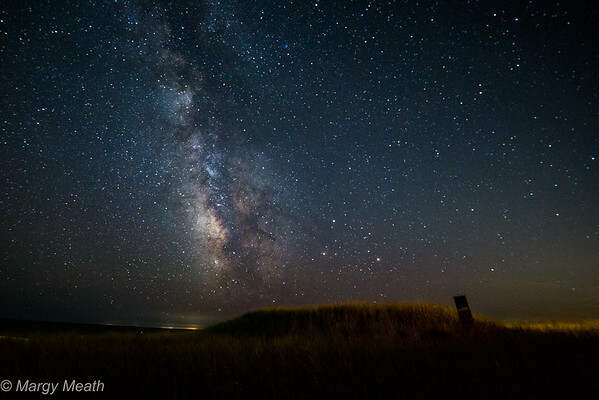 Topic - Milky Way Photos- thanks Al! !